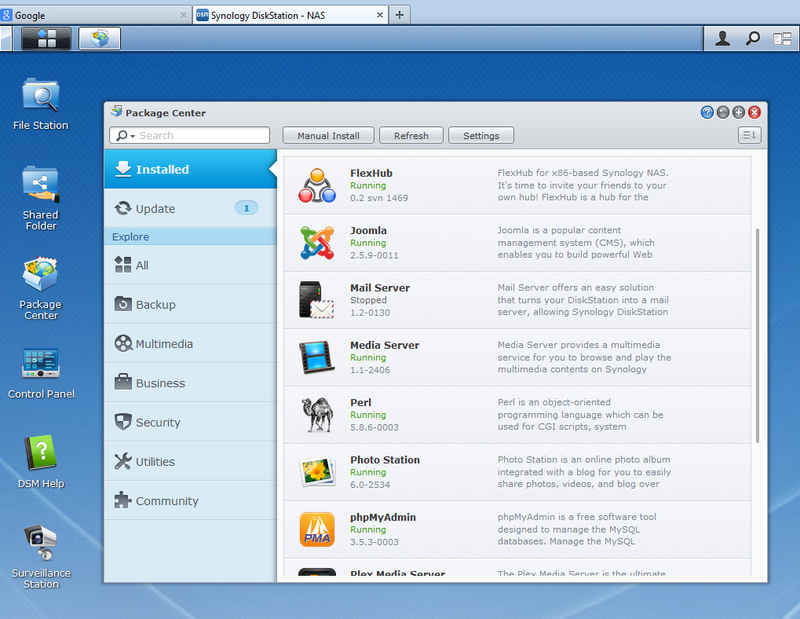 Finally, here it is: FlexHub for Synology NAS systems. DS114+, DS214play, DS411+, DS411+ II, DS412+, DS710+, DS712+, DS713+, DS714, DS1010+, DS1511+, DS1512+, DS1513+, DS1812+, DS1813+, DS2411+, DS2413+, DS3611xs, DS3612xs, RS810+/RS810RP+, RS812+/RS812RP+, RS2211+/RS2211RP+, RS2212+/RS2212RP+, RS3411xs/RS3411RPxs, RS3412xs/RS3412RPxs. We haven't been able to test them all ofcourse, so if you encounter any problems on any of the systems above, please let me know. The package installation asks for a loginname and password, those will be set as hubowner account and with those details you can login using a DC client, ApexDC++ is recommended. Installation will then ask to choose a port, choose a free port (for example 411) and make sure that port is properly forwarded to your NAS IP. Also is there a client version available for on the NAS itself? So we can use our NAS both as a hub and client? How can I install this on my NAS? Is it done via the terminal? NCDC and Microdc2 only works from the terminal. I guess the most simple solution is to first install "screen" through IPKG (if you haven't installed IPKG yet just google how to do that on synology) - that way you can keep NCDC running in the background on your synology if you close the terminal window. Once screen is installed just remember to type "screen" before starting NCDC - if you close the terminal window you can reopen the screen-session in another terminal window by typing "screen -r"
Hi, how install this package ? Do you have a Synology NAS? So I have installed this and been very excited to use this for ages, my one question is, how do I set up the server? So it knows what to share and what not to share? You have to be more specific about your question. It is a client that is used for sharing. I cant install it on my Synology DS214Play. I get the mess, This package not compatible with the platform. Please let me know if that new version can be installed.